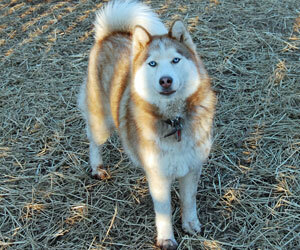 Merlot is a very pretty 2 year old red and white husky that is sure to charm you. She loves people and enjoys chasing and playing with other dogs her size. She is a social girl ~ everyone she meets is a friend. This girl loves to talk about any subject with beautiful woo-woos. Merlot is housebroken and trustworthy in the home. She will do best in a home with older children and another canine playmate to keep her company. She loves walks, car rides and any activity where she can be part of the family. Merlot is a pretty girl, inside and out, and like her wine namesake; she will only get better with age! If you are looking for a companion to share good times and always be by your side, Merlot would love to meet you!